Rumors abounded that The First Dog Bo had flown out to Hawaii on Saturday with the First Family then returned to Washington D.C. for the Wednesday photos. However, White House clarified the big question and said Bo stayed in Washington and never went on holiday with First Family. Barack Obama’s dog Bo did not fly back just days after his Hawaiian holiday began so he could take part in a presidential photo call. Michelle Obama’s press office had earlier said Bo would be leaving with the First Lady and her girls for their Hawaii holiday last Saturday. A Hawaii eyewitness said he saw the Portuguese Water Dog taken for a walk earlier this week, ahead of President Obama’s delayed arrival. But now the White House has told the Honolulu Star-Advertiser that Bo has been in Washington all along and never left for Hawaii in the first place. Eyewitness Scott Miscovich blamed the sighting on his wife, whom he said must have seen “another black dog walking our neighborhood”. The same newspaper had reported earlier this week that “the family and first dog Bo arrived at Joint Base Pearl Harbor-Hickam”. The White House Dossier blog speculated Bo could have come back on the plane that first took Michelle Obama out to Hawaii on Saturday. The bill for the $4 million trip rose by $100,000 when Michelle Obama decided to take Sasha and Malia early while her husband sorts out the economy. The National Enquirer even reported Bo is flown to holidays on a separate plane with Secret Service agents, but this was never verified. 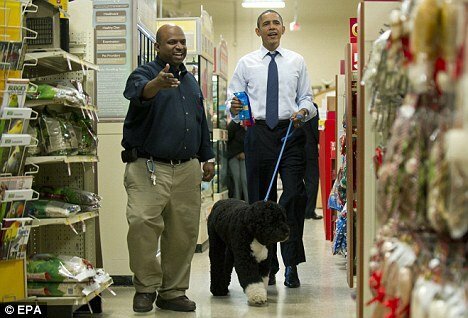 President Barack Obama took Bo on a shopping trip to PetSmart on Wednesday where he bought two items including a dog bone with a $50 bill. The First Family will return home on January 1. It is not yet known whether Bo will go with President Barack Obama when he flies out to Hawaii.